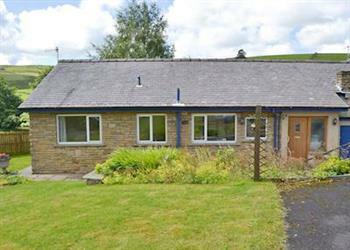 Fairfield in Barley, near Clitheroe sleeps 6 people. Fairfield near Clitheroe is located in the small, pretty village of Barley; Fairfield offers spacious and comfortable accommodation, ideal for families wanting to explore all that this beautiful part of the country has to offer. Enjoying an elevated position within the village, the property has lots of space inside and out with a fantastic conservatory overlooking the enclosed garden, which slopes down towards the stream. Barley, which has won the title of Lancashire’s best kept village several times, is within 150 yards of the property so the local pub, café and restaurant are all within a very short walk. The village also has a picnic area which is one of the prettiest in the North West being situated at the foot of Pendle Hill. The area is very popular with walkers who want to climb the hill, follow the Pendle Way or take the Witches Trail. Barley is located within the Forest of Bowland (Area of Outstanding Natural Beauty) and is surrounded by beautiful Lancashire countryside. The Ribble Valley with its stunning scenery, pretty villages and country inns is right on the doorstep. The market town of Clitheroe with its Norman castle and variety of shops, bars and restaurants is just 8 miles away. The Lake District, the Yorkshire Dales and the Fylde Coast, whose popular resorts include Blackpool, Morecambe and Lytham St Annes can all be reached in under an hour by car making this a great base for a touring holiday. Shop and restaurant 3 miles, pub 150 yards. 9 steps to entrance. All on ground floor: Living/dining room with patio doors. Kitchen with breakfast area. Conservatory. 3 bedrooms: 2 double (one 5ft), 1 twin. Bathroom with shower over bath and toilet. Separate toilet. Wood burner in living room (initial fuel included). Oil central heating, electricity, bed linen and towels included. Travel cot and high chair on request. 32 Freeview TV. DVD. Electric cooker. Microwave. Washing machine. Dishwasher. Freezer. Wi-Fi. Enclosed lawned garden with sitting-out area and furniture. Parking (2 cars). Natural water supply from borehole. No smoking. NB: 3 steps in garden. Holidays at Fairfield run from Friday to Friday. For a better idea of where Fairfield is, you can see Fairfield on the map below. Fairfield is in Lancashire; should you be on the lookout for a special offer, you can find all the special offers in Lancashire. It's always worth checking to see what is on offer at the moment. Do you want to holiday near Fairfield (W44195), you can see other cottages within 25 miles of Fairfield; have a look to find your perfect holiday location.